Cassie Sullivan is a teenager, who is trying to find her place in the world, but then suddenly everything changes. 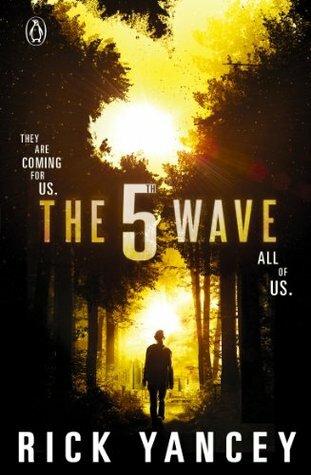 The world is thrown into chaos by an unexplained electromagnetic pulse. Everything powered by energy stops. Cars refuse to move. Homes cease to operate. Planes fall from the sky. It’s the 1st wave. The aliens have arrived and there are more waves to come. Although unlikely, the underlying plot presents a confronting scenario. It had me seriously questioning what I would do, and I assume many other readers have done the same. How would you survive if everything you depend on and took for granted suddenly stopped? By the time I reached 20%, I was hooked. Cassie is a relatable character who had no choice but to move from her normal existence to one of unimaginable hardships and horrors. It’s a story about losing everything, and then needing to find a way to survive. And of being forced to grow up fast to deal with decisions a young woman shouldn’t have to make. I could only imagine how hard it would have been for Cassie to make her decision to ensure her little brother’s safety. At one point I did became a little confused. It was when I reached the Wonderland section. The pov switched to a male and I thought that I must have tuned out and missed some important part of the plot. I continued to read, hoping I hadn’t made some big mistake. Then, once the male pov was finally revealed, I breathed a sigh of relief. Phew… there was a link to Cassie Sullivan. Once, I had that plot line under my belt, another angle entered. The story became more intricate and the weave of multiple threads kept me guessing. I was on the ride, and keen to see how it all panned out. I’m trying to keep this spoiler free, so I hope it’s making sense. Back to, Cassie. Absolutely everything is a struggle. Food, water, shelter, loneliness, and all the while she knows that she’s being hunted. It’s a living nightmare that seems hopeless. But she is stronger than she ever imagined, and it’s a promise that she makes to her little brother, Sammy, that drives her forward. Making her determined to never give up. Every moment she needs to dig a little deeper than the last. Knowing who to trust, letting go of the past, and clinging to every last ounce of hope for a future. They are all facets of Cassie’s story. The perfect ingredients that all dystopian fans love to read. We see her cautiously team up with another survivor, Evan, who offers to help her keep her promise. Should she trust him? Should she kill him? Is he human? What should she do? I got a little lost in this part. At one point, Cassie came to a decision important to the plot, but I just didn’t understand how. Maybe I missed the clue. Finally, after a journey full of all unimaginable challenges, the sub plots collide in an exciting climax. It was a scene that I could see coming, but I enjoyed seeing it play out. Although there were a few parts that confused me, I still thoroughly enjoyed this book. There’s plenty on offer. Suspense. Hopelessness. Danger. Betrayal. Trust. Romance. Family. It’s a good start to a series. I liked it and I’m looking forward to the movie early 2016. If you’re keen to know more, then click below to head on over to Rick Yancey’s website.